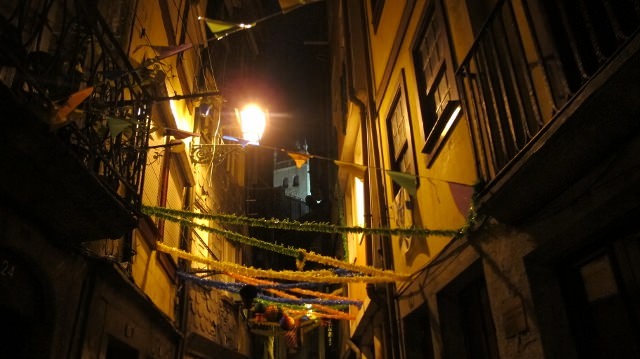 The week I arrived in Porto, colourful flower arches straddled the streets in preparation for Sao Juan Day. 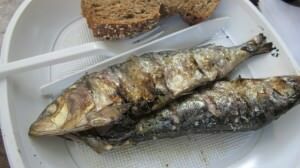 Also the start of summer solstice, on June 23 everyone eats salted barbecued sardines and caldo verde (cabbage and potato soup) followed by pastries. 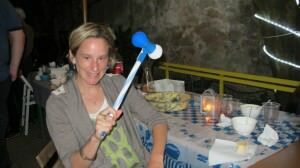 Then, everyone takes to the streets hopping from neighbourhood to neighbourhood, all night, in search of a dance, a drink or chance to bop passerby’s on the head with a plastic hammer. Que? A little google search revealed that when someone taps you on the head, it is for good luck. Walking through the packed streets, it was like a little love tap from strangers; with hundreds, thousands, of people, it sounded like squeaky sneakers. Historically, Sao Juan was a little scoundrel so he often got a little pat on the head to “follow the right path.” A gentle reminder. This picture is in Porto looking over the river to Gaia–a street lined with port wine warehouses and restaurants. Fueling up for the big night: salted barbecued sardines. 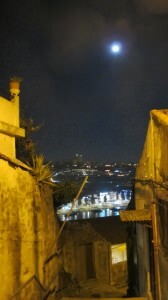 A giant full moon is also hanging over the city making the night felt even more surreal–pulsing music, the smell of sardines, the movement — in search of new people to meet — stopping just long enough for drink or dance. A memory and then it is on to the next. Sometimes we’d turn a corner and find no one. But, you could still feel the energy. 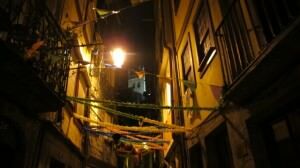 I also felt unbelievably safe stopping to talk and drink with people sitting on a set of stairs or dancing in a court yard. I can’t help but think if you had the same number of people, but somewhere else, fights would break out. Portuguese are soft and kind. Supposedly banned this year for safety reasons, Portuguese have a healthy dose of breaking the rules when required. Beauty trumps regulations. The paper balloon comes with a small wax candle at the bottom. 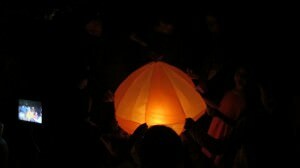 As everyone holds it, the balloon inflates–as it lift and fills, you make a wish and let it go. The strong wind carried them fast and high into the dark sky. It was like beautiful dandelions floating over the city. Morning is coming but the energy didn’t wane. Letting go of balloons, making wishes and giving good luck — I’ve never experienced anything like it. Running up stone steps to reach the next party, I wasn’t tired at all. 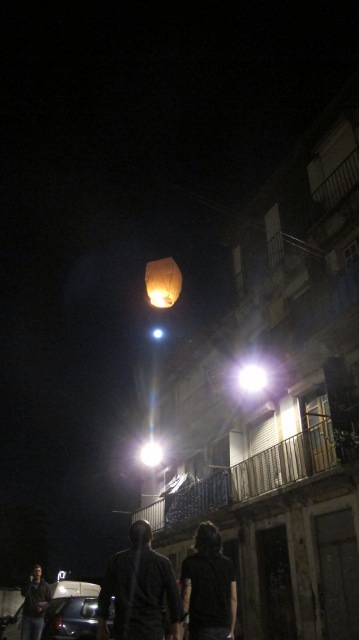 I felt like I was one of those paper balloons, lifting up and up as the morning got closer. 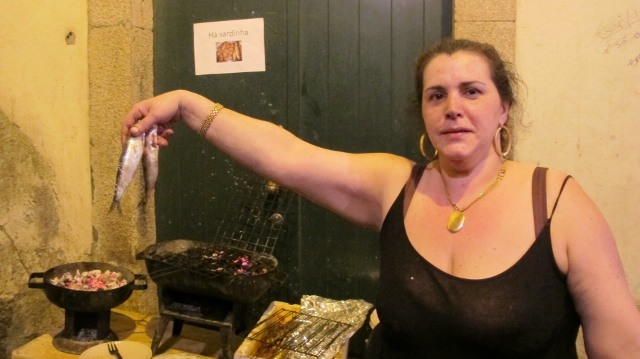 Wonderful words about São João and Porto! Your writing is so well articulated. Easy and breezy like being there where ever you go. Thanks for sharing.